Ascents Cancelled For Two Consecutive Years. Traffic of climbers was thick this year at Mount Everest Base camp, as a disaster last year had resulted in an unfortunate cancellation of all scheduled summits. Aspiring climbers and the Sherpas had huddled around and started making preparations right from the third week of Chaitra (early April). There was a nasty snowfall during the beginning of the Nepali new year in Baisakh (mid April). It pushed the climbers at the base camp into their tents and halted their preparations for several days. However, the determined climbers were least bothered, as the early snowfall is usually said to stabilize the snow on mountains, which prevents avalanches. To most climbers who have dreamt of conquering the Mount Everest, an avalanche is the most dreaded trouble. 16 Sherpas had lost their lives last year to an avalanche at the Khumbu Icefall, which comes right after the first uphills over base camp. The early snowfall this year had stopped on 17th April and the first ascents could have headed on the 18th. However, as it was on the same day that last year's avalanche had struck, the Sherpas chose not to climb on what they called the 'black day'. The 18th April was just another day and was silent this time. On 21 April, the Everest Base Camp. PHOTO: Pradeep Bashyal for Nepal Magazine. The 'black day' apparently pushed itself further by exactly a week, to invite a bigger disaster that was out of the imagination of climbers, the Sherpas or the ascent companies. Australian climber Liam Slater told the Nepal Magazine, "Such a disaster could not be expected at least at the basecamp. Relevant preparedness is out of question." The disaster this time, however, was not just about the Mount Everest or the mountains. The earthquake measuring 7.6 Magnitude on the Richter Scale had rocked central Nepal, and it killed at least 21 climbers on the foothills of Mount Everest alone. Nearly 200 other climbers stranded at the Camp 1 and 2 were airlifted to safety only on the third day after the disaster. Altogether 358 climbers belonging to 42 climbing groups had taken permission from the government of Nepal for the ascent this year. It was fortunate, nevertheless, since no one was at the Icefall either climbing up or down at the time of Earthquake, as the disaster struck in the afternoon. "Icefalls are made of layers of snow traps and even a small tremor can invite an avalanche," Slater says. "People usually pass through the Icefall on early morning. For this reason, an avalanche at the Icefall this time did not claim any lives." However, all vertical and horizontal stairs installed there by the Icefall doctors got destroyed. As the Icefall doctors clearly indicated that repairing the stairs soon is out of any possibility, there was no other option before government than canceling all ascents this season as well. In any other case, the government of Nepal was not in favor of marking a second consecutive year without any summits on the highest peak in the planet. Before the Icefall doctors indicated there was no possibility of any summits this year, the Sagarmatha Pollution Control Committee (SPCC), which had already been handed a responsibility of repairing stairs up to Lhotse-face was all prepared to carry out its job – the new stairs and other materials had already been brought up to the base camp. Climbing guide Migma Tashi Sherpa (31), who has made it to the top of the Everest for six times, said, "The efforts that were being made to repair the stairs and resume climbing season all seemed futile to us. All possibilities looked very unlikely." Was it really impossible? "Guiding a climber up to the top is a matter of pride to every Sherpa," Migma said, after a bit of pause. "But when it is against the nature, there is very little or none we could do." That was a nature's call indeed. Many dreams to be on the top of the world have been shattered for two consecutive years. Since 1974, this is the first time, ascent has been called off from both Nepal as well as China. The climbers and sherpas ascending towards Khumbu Ice-fall. Base camp of the Mount Everest is spread in an area of about two miles. The basecamp that settles with Khumbu river flowing by it would not have been a special place on earth had it not been for all the different people huddling together from different parts of the world, making it look like a 'city of tent'. Looking at the settlement from a bird's point of view would feel like flying over a majestic colorful garden. The Sherpas and the climbers had started climbing uphill from base camp only two days before Baishak 12 (April 25). The climbers, in a bid to acclimatize with altitude, keep going back and forth up to Camp 1 and 2 from the base camp before giving their ascent a final push. After the snow stopped, the high altitude porters had started climbing with food and tents on Baishak 6 (April 19), while the climbers gradually followed them. On the day of the earthquake, a huge group of climbers had just returned to the base camp by completing a massive cycle of acclimatization through Camp 1 and 2. While many were resting into their tents after climbing exercises of the morning, Gyaljan Sherpa, the six-time summitteer, was preparing to leave for the top of Everest with his team of Chinese climbers. But it was a Saturday and according to Buddhist beliefs, starting a journey or any form of major transaction on Saturday is said to be a bad omen. "I can't even imagine what could have happened if we had already left," Gyaljan says, recalling that surviving even at the base camp was a very hard luck. Gyaljan was at the dining hall when he heard a bang outside the tent. When he rushed outside, he was taken aback by a cloud of snow dust coming towards the base camp from Mount Pumori towards the West. He quickly sneaked into a drum used to carry high-food. Sharing his experience with Nepal Magazine, he said, "Everything happened within the flicker ofseconds. The mind was numb and it was as if all the decisions were being taken solely by the body." The snow dust cloud vanished in a couple of minutes. However, its impact was so dreadful that the tent of Gyaljan slipped up to the Khumbu River. "I initially thought that the cloud would not reach the base camp," he said. "But I was wrong. The cloud not did not just have air and snow particles in it. It even carried pebbles and ice lumps. We could even see the gas cylinders flying above our heads." Apart from the trained climbers, there were a number of untrained people at the base camp including kitchen staff and porters. "They didn’t know that they shouldn’t have run in an avalanche," Migma said. "Many lost their lives just because they tried to run away." Migma and his three friends were able to save their lives by clinging on to the all four corners of the kitchen room. After his team of Chinese climbers started panicking, Gyaljan Sherpa rushed them to Gorakhshep . Just as he was about to leave again for base camp after leaving the Chinese climbers at safety, there was another strong bolt. As it would be too dangerous to go back to base camp due to continuous aftershocks, Gyaljan stayed at Gorakshep that night and went to base camp the next day. To Migma, the situation at base camp was no less than a horror film. More than 100 out of nearly 1500 individuals at base camp were seriously injured. There was no any record of those who had sustained normal or average injuries. "There were only about 10 to 15 stretchers at the base camp," he said, "We had never thought that more stretchers would ever be needed at base camp." After Ice-fall doctors underscored that it was impossible to repair destroyed pathways to Mount Everest, the climbing season has been suspended for this year. Under the given circumstances, none will be willing to climb the Everest only with the help of Sherpas. Even the alpine climbers will not want to take the risk with ongoing aftershocks. "Due to the national crisis, the council of ministers has not been able to think anything about the climbing season," said Gyanendra Shrestha of Department of Tourism Promotion, "But the official decision is yet to be made." That apart, the climbing confidence of Sherpas has also gone down due to the problems stirred by earthquake in their own families. "It is not just the road to Mount Everest that has been damaged," said Shrestha adding that even the road to Base camp has been damaged. "We had earlier thought taking 15 days to repair the climbing route. But that would be impossible." The Chinese government has also suspended climbing from the North face for this season. However, it has provisioned that individuals and groups who had taken permissions for this year can come back again within three years. Climbers have demanded the Nepal government also to decide something similar. Geljing Sherpa (29) who is currently undergoing treatment at a hospital in Kathmandu is disillusioned about climbing. In 2013, he was only 848 meters from the top of the Everest, when his climber was caught by high altitude sickness and had to return. The climbing season was suspended on 2014 as well. He has himself been injured this time. "I don't think I will ever climb again," he said from the hospital bed. "I will rather run a hotel at the village." His sister, who was sitting beside him at the hospital, smiled and said, "This resolution may hardly last before he walks out of this hospital. I can't imagine his life without climbing." 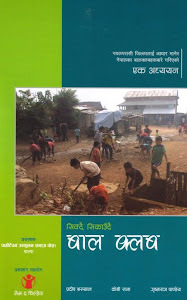 Originally Appeared in Nepali language in Nepal Magazine. Click here to read in Nepali.